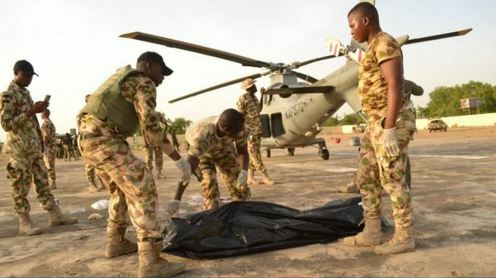 Officers of the Nigerian Air Force (NAF) involved in the fight against insurgency, on Sunday, suffered a setback as the rotor of a helicopter killed an air chief marshal simply identified as Umar. Naija News learned that the aircraft was said to have developed a fault. A report by TheCable quoted an airman, who witnessed the tragic incident, to have said that the ugly incident happened at Bama in Borno state on Saturday evening. It was gathered that late Umar, who was the co-pilot, had gone to the pick his bags and on his way back, he passed through the side of the rotor which was functioning. “Immediately his head was chopped off,” the source said. “The aircraft has been recovered and taken back to the airbase. No damage was found the on tail rotor,” the source said. the body of late Umar wrapped. The report noted that the tragic incident reportedly occurred around 4 p.m on Saturday. According to a source, family members of the deceased have been informed. Meanwhile, the burial arrangement of late Umar was on as of the time this report was filed.